Let’s just address the big banana in the room right off the bat. I would argue that actual bananas are not a great option for Keto. Why? Because, according to a quick Google search, one medium banana contains 27 grams of total carbs! Even if you took a banana and split it between several servings, that’s still more carbs that I’d like for a recipe! That doesn’t mean I don’t love the flavor of bananas. Even my husband, Joe, loved the flavor, and he’s “allergic” to bananas (self-diagnosed). This recipe uses banana extract to achieve that delicious banana-y taste. I was admittedly a bit skeptical at first, but it works! You can find it at any grocery store near the spices and things like vanilla extract, or you can buy it online. There’s always a lot of chatter and debate over eating fruits on a ketogenic diet. I think knowledge about how many carbs is in the fruit you’re interested in and listening to how your body reacts are super important to figuring out what works for you. That said, if you’re looking for another fruity dish check out these amazing keto lemon bars! Anyway, the recipe we’re focused on today is for these very moist (sorry if you hate that word, but they are!) and tasty muffins that are perfect for any time of day! For this recipe we’re using a base of almond flour. I haven’t tried it with coconut flour, but I do believe with some tweaking that could work…the issue is, it’s not always an easy swap. So feel free to play around with it, and let me know the results! 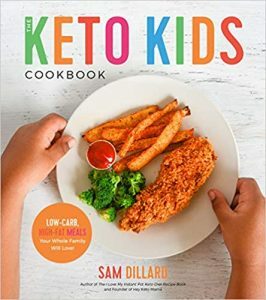 Lately I’ve been working on more keto, kid-friendly recipes to help encourage kids who are a part of the low carb lifestyle to get in the kitchen with their parents to create yummy, and easy meals. 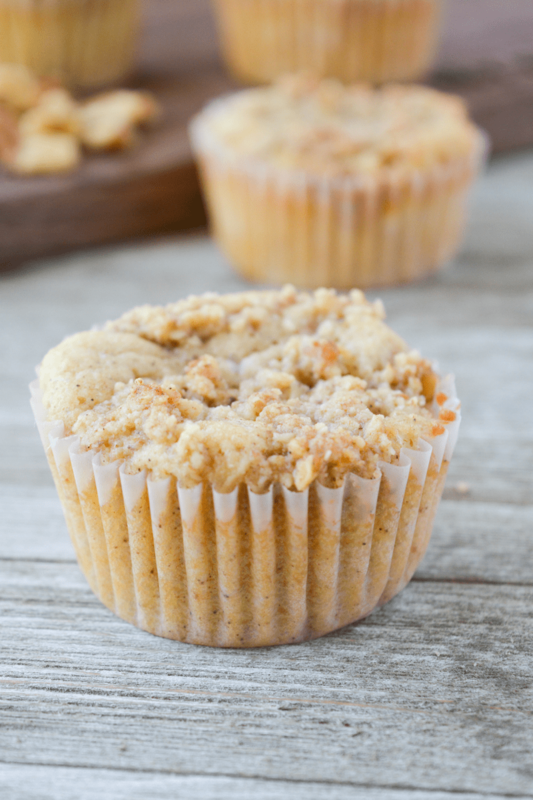 I hope you enjoy these delicious keto banana nut muffins! Tired of eggs for keto breakfast? 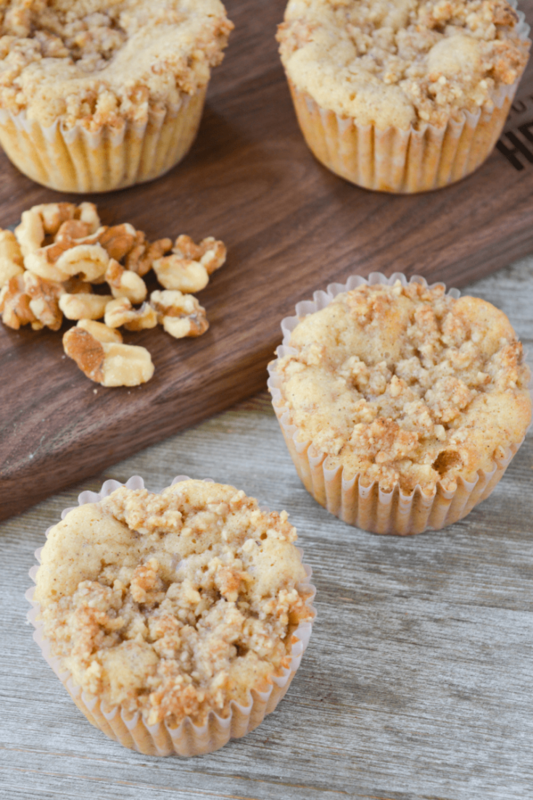 These Keto Banana Nut Muffins are so simple and delicious, your kids will love helping you make them on the weekends just as much as they'll love helping you eat them! Preheat oven to 350 Prepare muffin tin with 10 paper liners, and set aside. In a large bowl, mix almond flour, erythritol (or preferred sweetener) flax, baking powder and cinnamon. Stir in butter, banana extract, vanilla extract, almond milk, and sour cream. Add eggs to mixture and gently stir until fully combined. Fill muffin tins about 1/2-3/4 full with mixture. **If you need more accurate measurements, weigh the batter on a food scale and divide by 10. That will give you the grams of batter per cup. Add walnuts, butter, and almond flour to food processor. Pulse a few times until nuts are chopped into small pieces. If mixture seems too dry (sometimes some walnuts are softer than others) feel free to add another tablespoon of butter. Sprinkle bits of the mixture evenly over batter and gently press down. Sprinkle erythritol on top of crumble mixture. Bake for 20 minutes or until golden and toothpick comes out clean. Let cool for at least 30 minutes, an hour or more if possible. This lets them firm up. *If they seem to be cooking faster, take them out sooner to avoid burning. Alternatively, if they are still wet looking, return them to the oven for a few minutes keeping a close eye on them. Is it unsweetened almond milk that you use? Do u have to use Banana extract? Could I just use bananas??? Bananas are higher in carbs so I used banana extract, since I don’t eat bananas. I haven’t tried it with real mashed bananas. If you use actual bananas I would make sure they are ripe, only use one, and omit the sweetener because the banana would sweeten it enough. These are very tasty. Great muffin consistency. 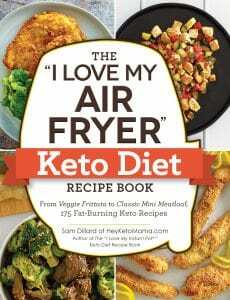 One of the best keto baked items I’ve tried yet. How should these be stored? They are amazing! I’d just keep them in a zip loc bag in the fridge! Glad you enjoyed them!! I would love to know how you came up with 4 net carbs, I made them today and my net carbs were 9.3 per one muffin. I didnt even make the topping for them because they were so high in carbs.. well for me anyway(trying to stay under 20 net carbs for the day). Not knocking the recipe at all just very curious why there is such a difference in mine compared to yours. They tasted great btw! Hi there! I updated the post to give a more in-depth breakdown of nutrition. I’ll be doing this on all recipes in the future. Glad you enjoyed them! These muffins are amazing! 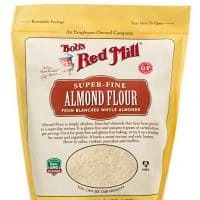 I’ve been doing Low Carb for about 6 months and have tried numerous recipes with Almond Flour and Coconut Flour and haven’t really found a muffin that I loved until now. Most are very dry and the texture just isn’t right. 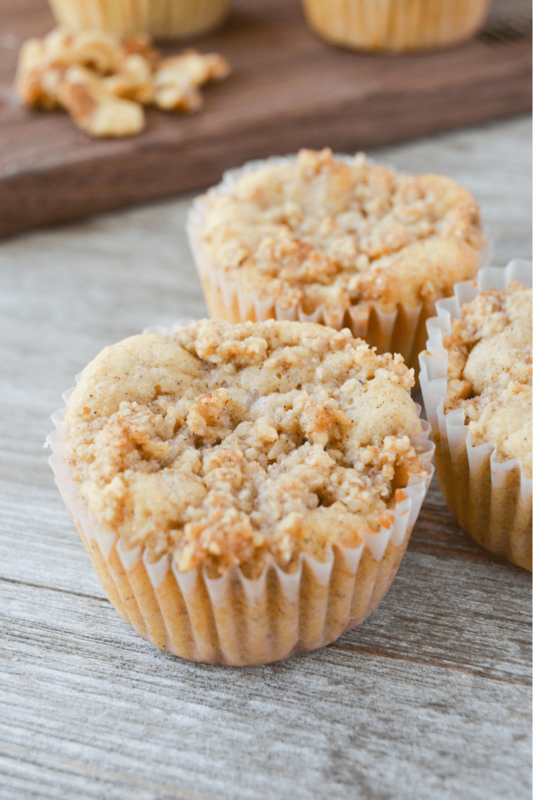 These are so much like regular banana muffins! This is such great recipe and probably could be the base for other types of muffins with a little tweaking. On a side note. I tried your Crispy Chicken Wings. Another winner!! Thanks for the great recipes!! These muffins were so delicious!! They were moist and had such a great flavor. Thanks for the recipe! Oh how I have missed banana nut bread. You are a genius. These are delicious! I actually made them into mini muffins so I could feel like I’m eating more at one time. Will try a loaf pan next and spread it with cream cheese which is my favorite way to eat the non keto bread. Thank you thank you thank you for sharing. Hi, would I be able to substitute sour cream with heavy cream ? I wouldn’t make that swap. I think it’ll really affect the texture and the firming up. I am excited to try this recipe! What do you think about substituting cream cheese for the sour cream? Just made these. 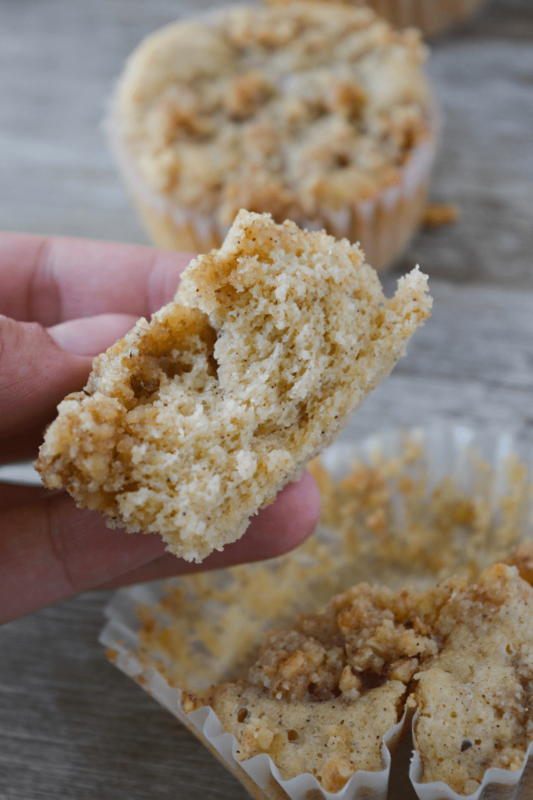 I have never” loved” a keto recipe before and I consider myself a connoisseur of banana nut muffins, so I approached this recipe with hope and and a good deal of skepticism. This recipe delivered a taste that would be hard to distinguish from the “real” thing. Thank you! That’s so kind of you to say! So glad you enjoyed it! Do you think stevia would work instead? This is a fantastic recipe! I love it! I don’t really like crumb-type toppings, so I skipped it and just stirred 1/4 c of chopped walnuts into the batter. Then, because my beloved daughter had “borrowed” my silicone baking cups to make bath bombs >_<, I baked them in a silicone brownie bite pan. At 1 TBSP of batter per square, it made 36 banana muffin bites. They still needed the full 20 minutes to bake (could just be my oven), but they turned out utterly delicious! 3.6 of these equal one muffin, so I'm guesstimating the per-muffin bite carb count at somewhere around 4.5 and the net carbs at about 1.1. (feel free to double check my math). 3 of these on a saucer with a cup of tea or coffee makes a delicious, filling snack that has even my low carb/keto doubting friends asking for more.. Thanks so much for a terrific recipe! Delicious and easy! Loved them- making the lemon bars next! 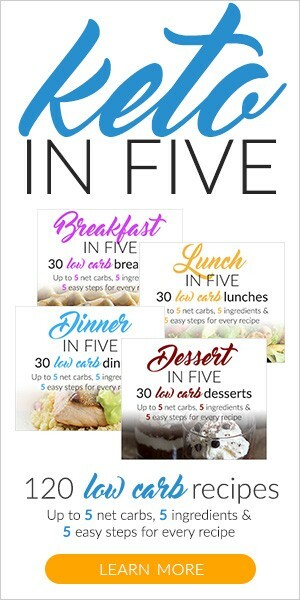 Love this site and all your recipes- it’s great and super helpful! These are so delicious. This is the first recipe I tried off your site, and I’ll definitely be scoping out your other recipes as I meal plan later this week. ???????? My muffins never rised and cannot figure out why, they just caved in. Any guess why? hmm, I’m not sure. I haven’t had that issue with these before. Only thing I can think of is that maybe it was the baking powder. When was the last time you replaced it? I forgot almond milk at the store???? do you think coconut milk would work? 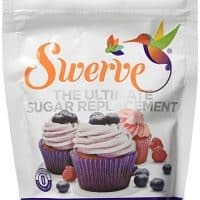 Would it be okay to use a granulated sweetener in the batter rather than a powdered sweetener? I hate erythritol but I haven’t seen a powdered monkfruit sweetener (which is what I prefer). I’m excited to try these because my son has been begging for banana bread. You can put granulated in a food processor anytime a recipe calls for powdered. I use my magic bullet. I can’t wait to try this recipe! I just made these tonight and they are delicious! I don’t know why, but I don’t get the banana taste coming through, which is odd because banana extract is strong. Oh well, I love them for the buttery muffins they are. Best keto muffins I’ve had so far. Thanks for the recipe! Hmm. Sometimes it tastes stronger the next day, hopefully that’s the case for yours too! This is probably my favorite Keto baked good recipe. I just made these and 💜💜💜💜💜💜 I’ve only been doing for 5 months and miss bananas 🍌 But this helped I even added a few Lilly chocolate chips I’m not a great cook but this was so easy THANK YOU !!!!!! Do i have to put sour cream can I substitute it with something else? I haven’t tried a substitute, but I have seen very low carb plain yogurts used in place of sour cream in similar recipes! I just stumbled across this recipe and made these for breakfast this morning! I used 1/4cup of monkfruit+erythritol, and 1/4cup full fat plain greek yogurt instead of the 1/2cup erythritol/1/4cup sour cream (because those are what I had on hand), and they were delicious 🙂 will definitely make again, though I might double the banana extract next time. That I haven’t tried, but I would expect them to freeze well. Please let me know if you give it a try! Oh my Goodness. These muffins are delicious, they are not dense like other keto cakes. the texture is like real (non keto) cakes. I will add a little more banana extract next time for a more banana taste. What is the best way to store them, in the fridge or can they be left out? I’m so glad you enjoyed them! I would just put them in a ziploc bag in the fridge for storage! These look sooooo good!! -Which brand of banana extract do you use? Thanks! I just made them and I can’t believe that they are Keto friendly and so , so delicious. 😋.